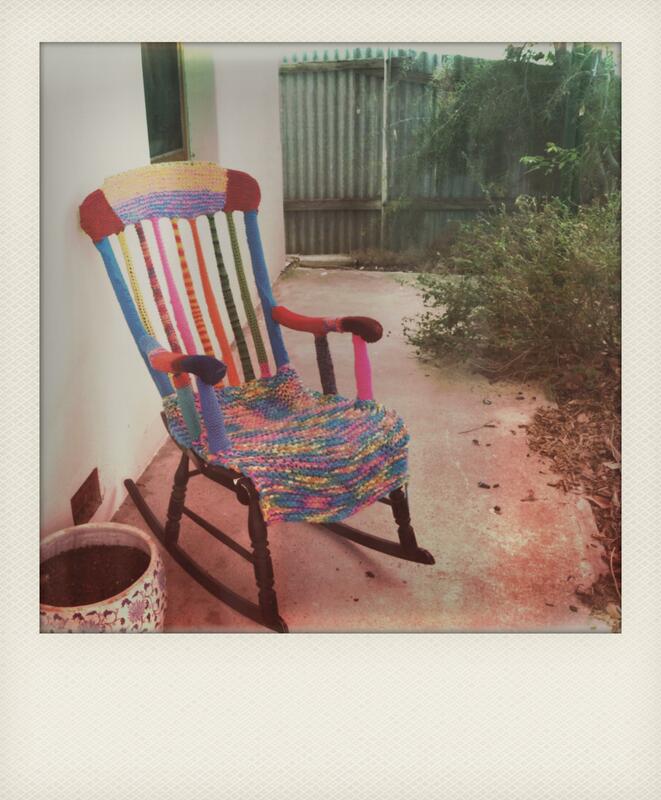 I yarn bombed this old rocking chair with my sister in law & now it brightens up her front porch. 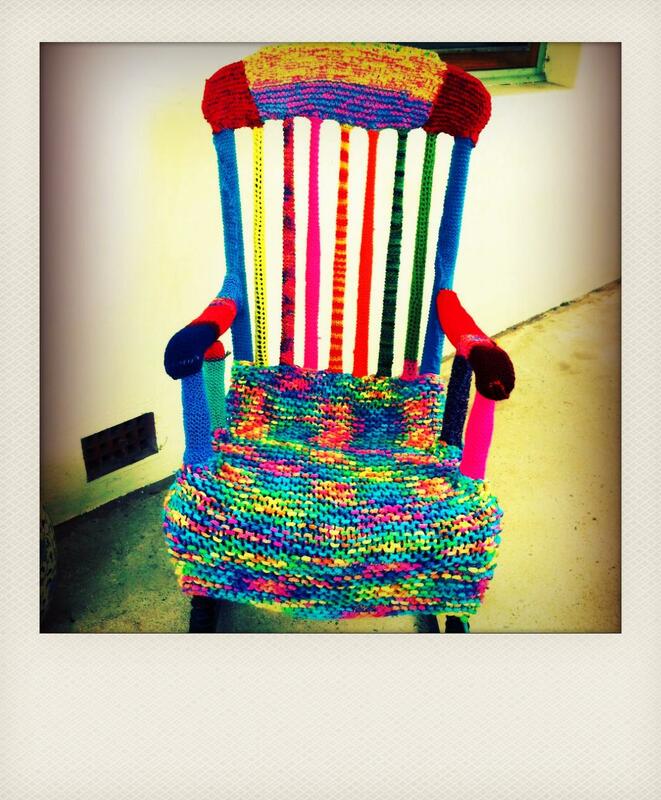 We used scrap wool & nylon ribbon to cover this chair & warm it for winter. 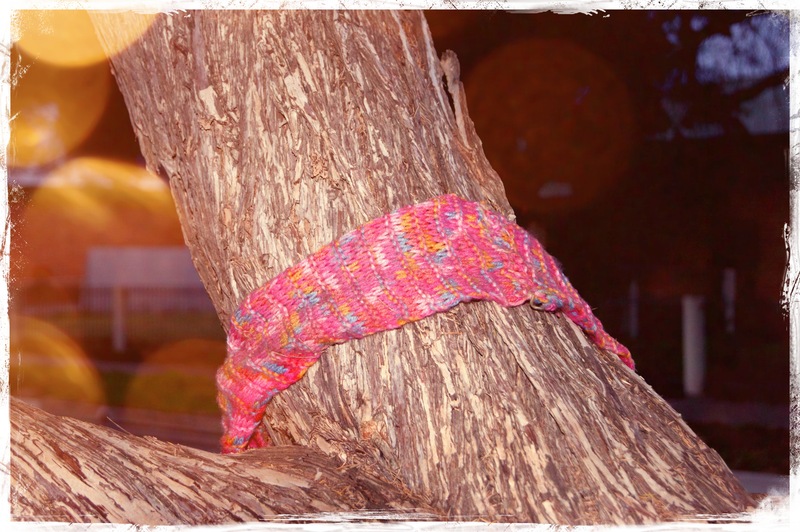 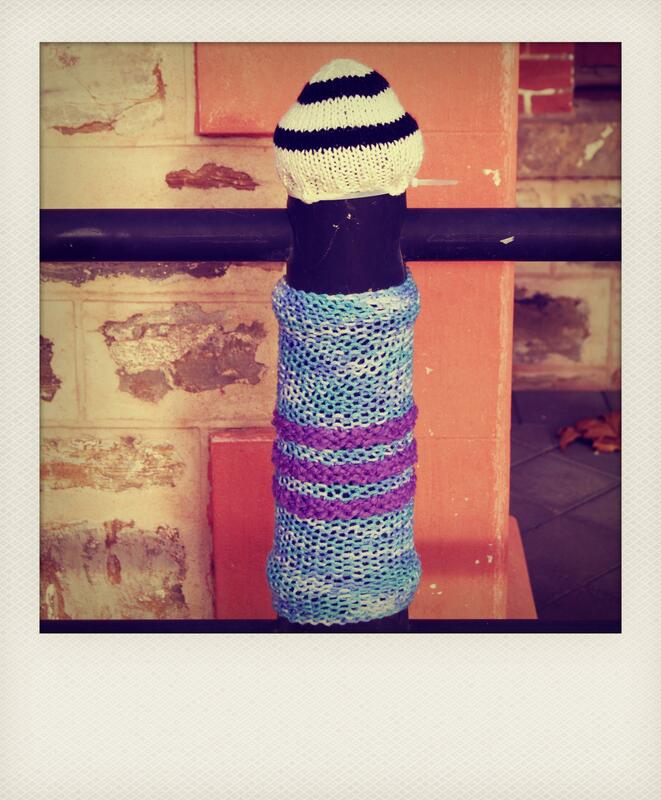 This old fashioned fence post has been yarn bombed with knitted scraps and a crochet hat. 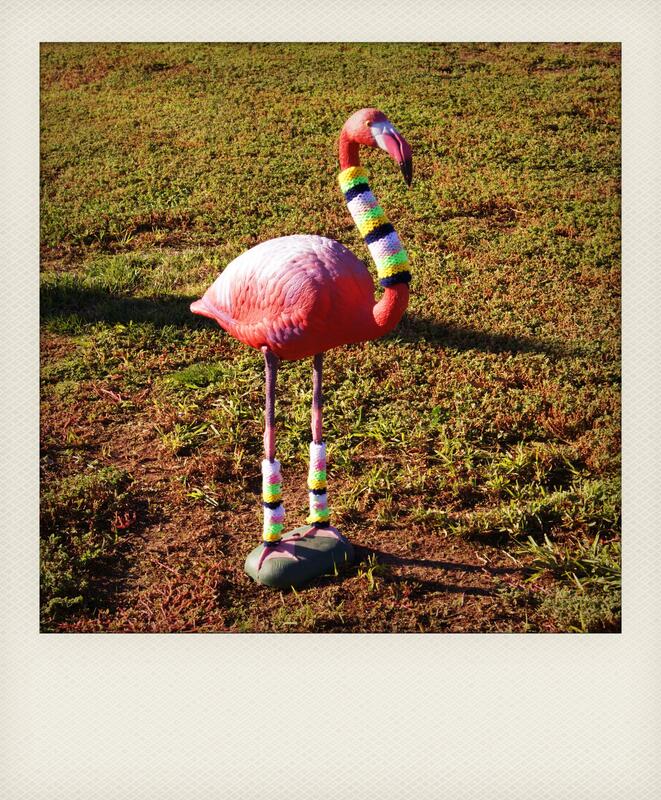 This flamingo has been seen around the local park wearing stunning knitted leg warmers and neck warmer. 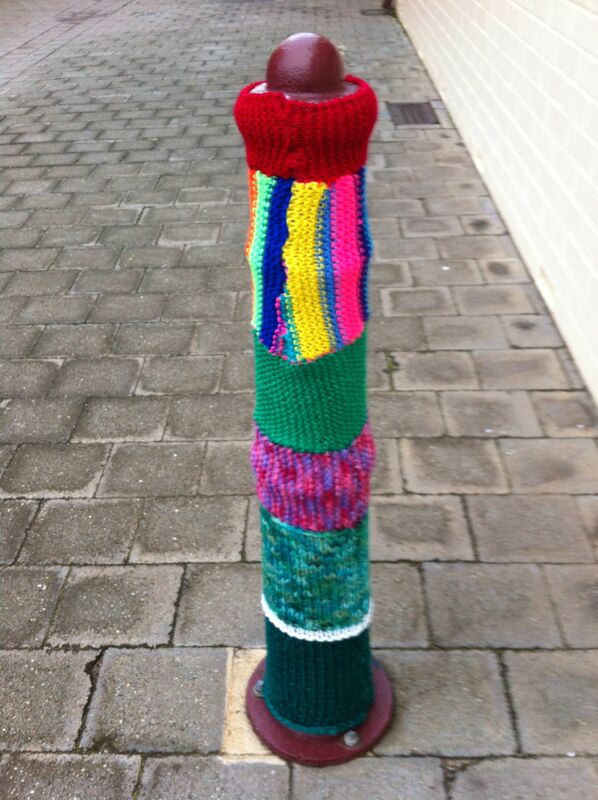 A tiny piece of yarn bombing being sewn to a pole. 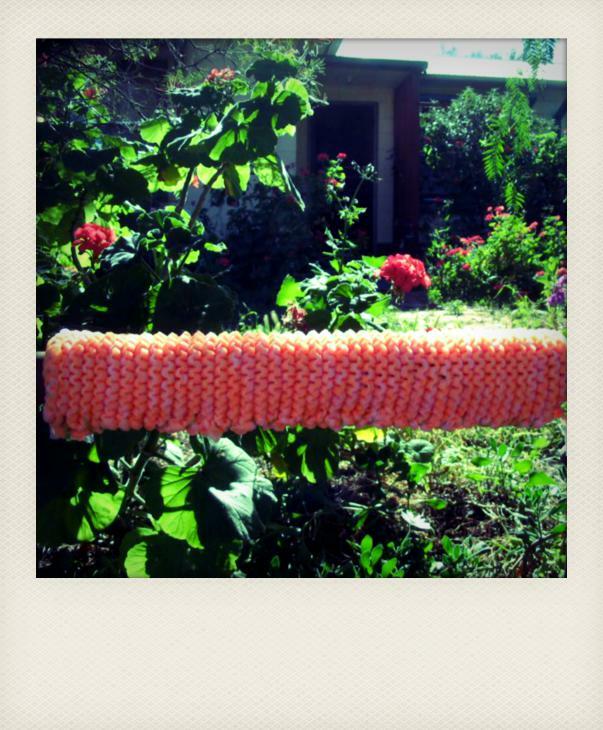 A piece of yarn bombing on the fence of my house. 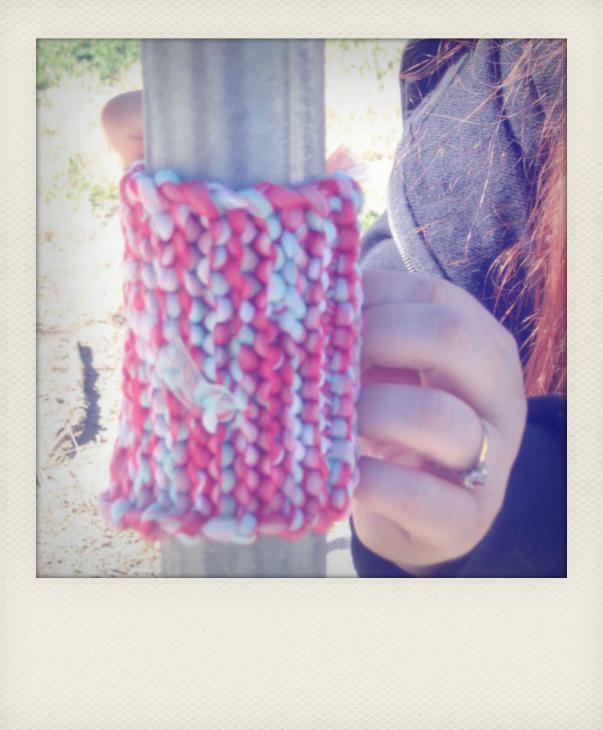 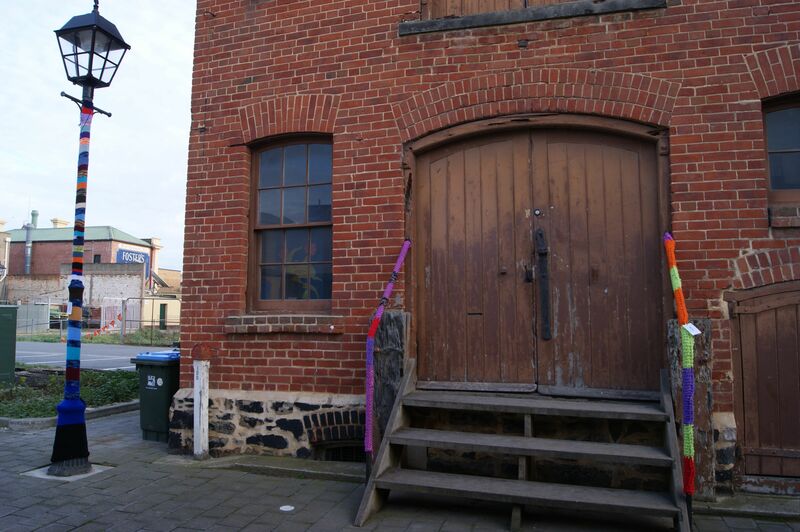 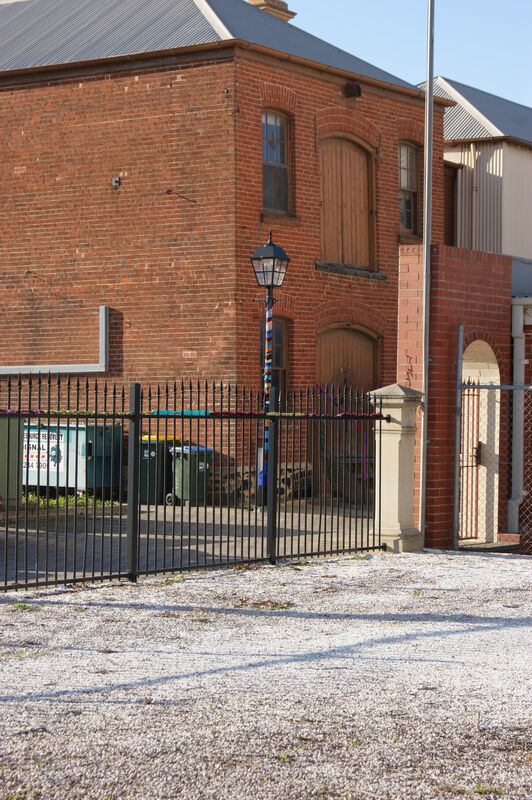 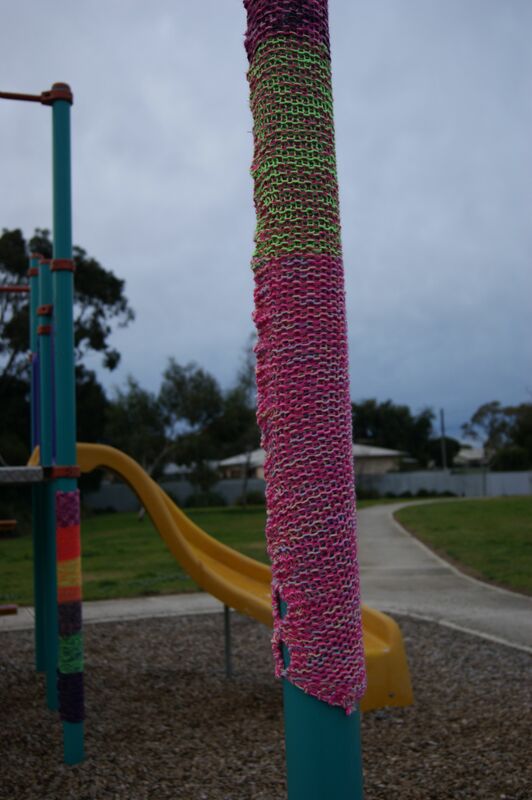 I yarn bombed this pole in Port Adelaide with a piece of knitting sprinkled with old buttons. 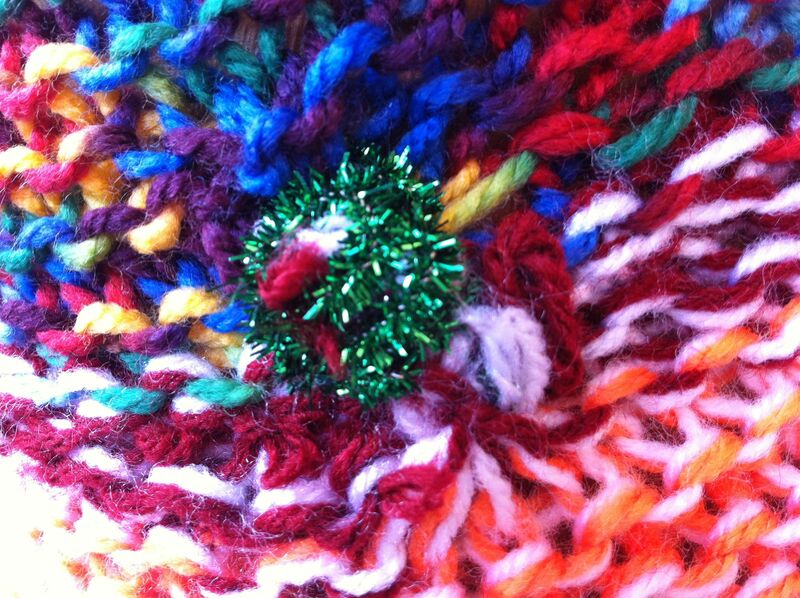 Here are some pictures of my colourful button collection which I enjoy sewing on my yarn bombed works and various craft projects. 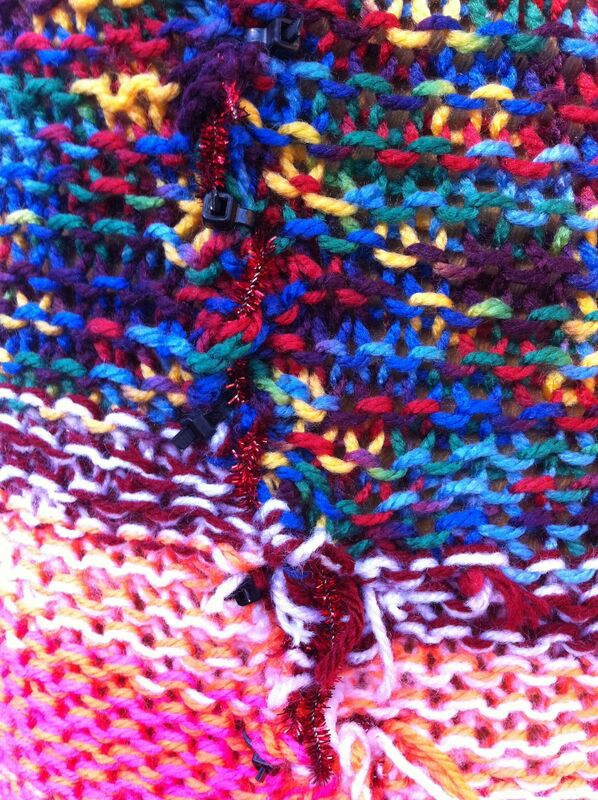 I love the colours and textures. 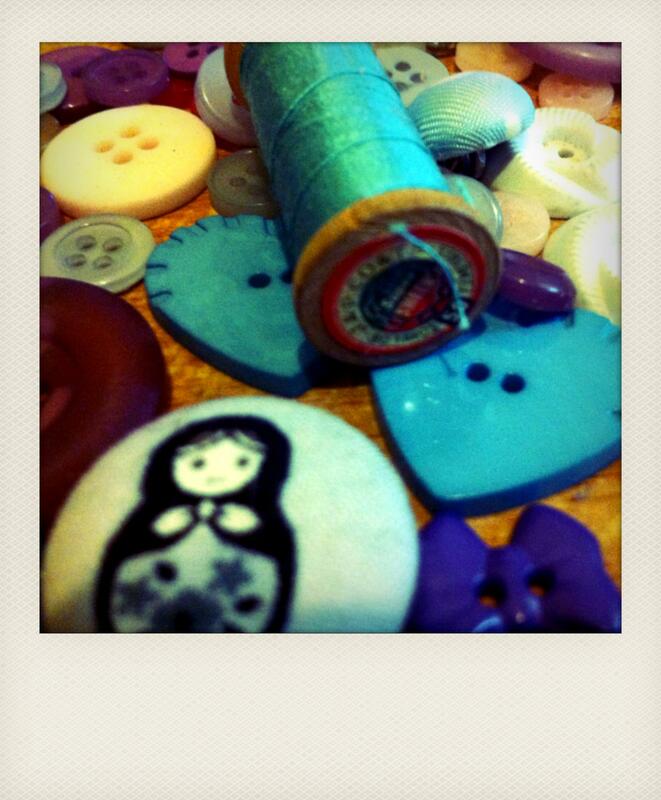 Vintage buttons are a small treasure which crafters like myself love. 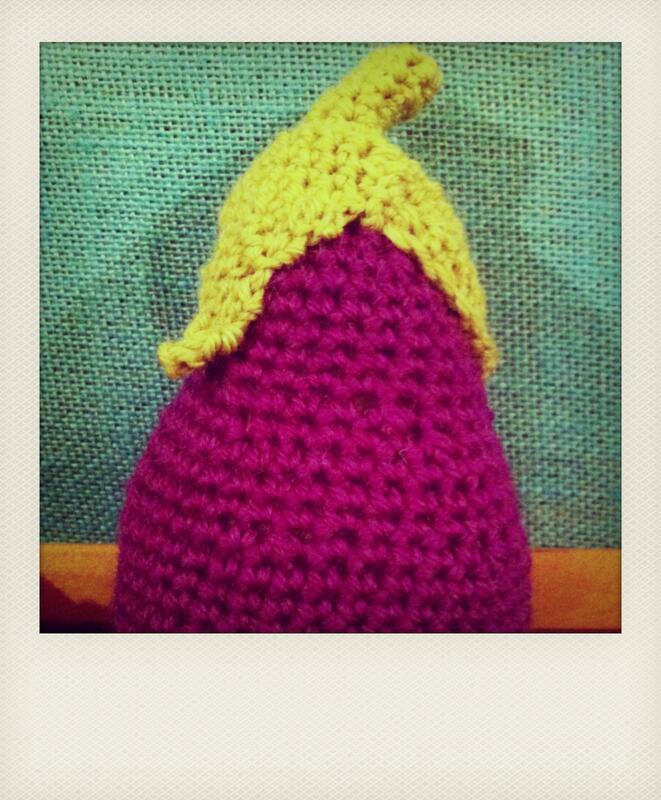 Craft items are a satisfying study in photography. 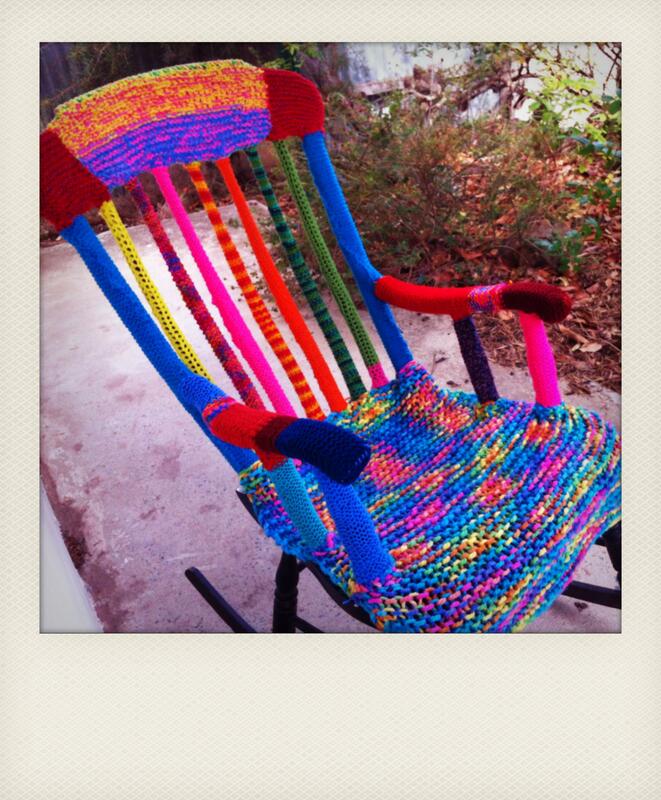 This entry was posted in Yarn bombing and tagged buttons, craft, crochet, knitting, photography, polaroid, rocking chair, yarn bombed pole on July 30, 2012 by yarnbomb. 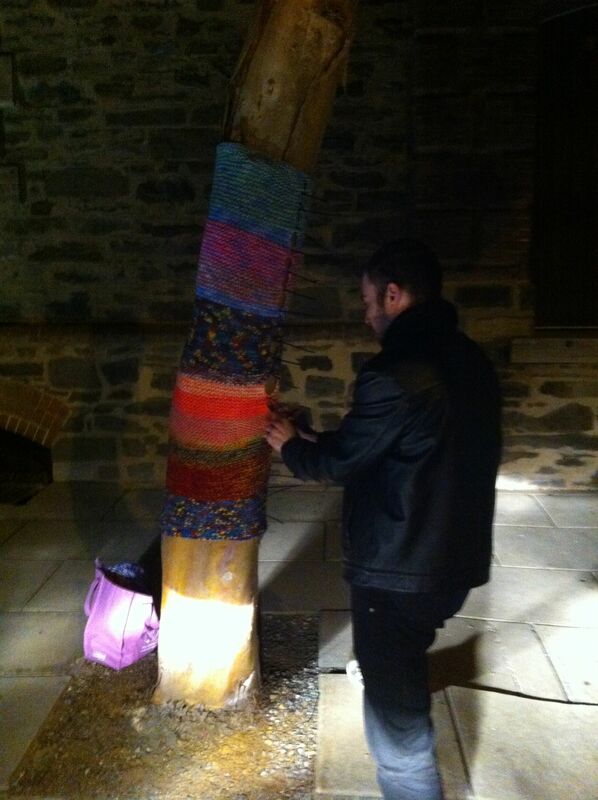 This tree was yarn bombed with a lot of love, a lot of yarn went into it and a lot of hours were spent knitting it, not to mention the effort involved in attaching it to the tree. 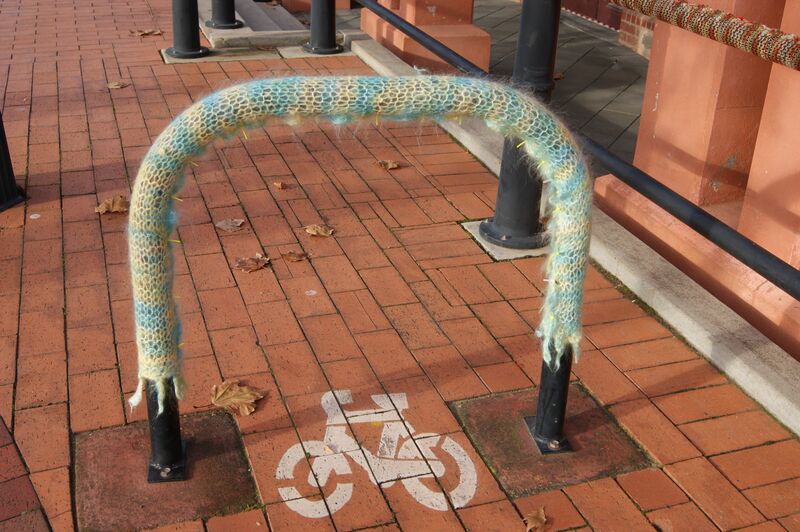 Unfortunately some vandals got to this yarn bombing with some sort of blade. 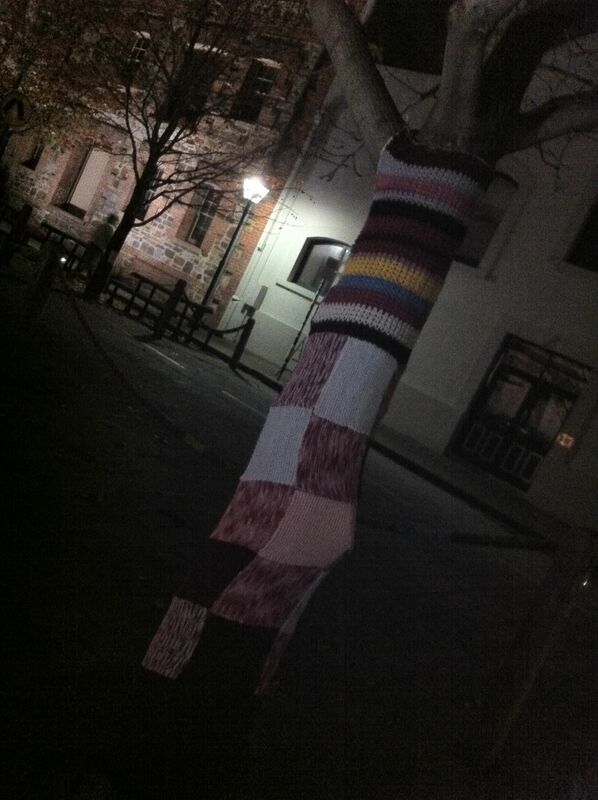 The good news is that the tree is happy and healthy and we got to the scene quickly and did some repair work on the knitting. 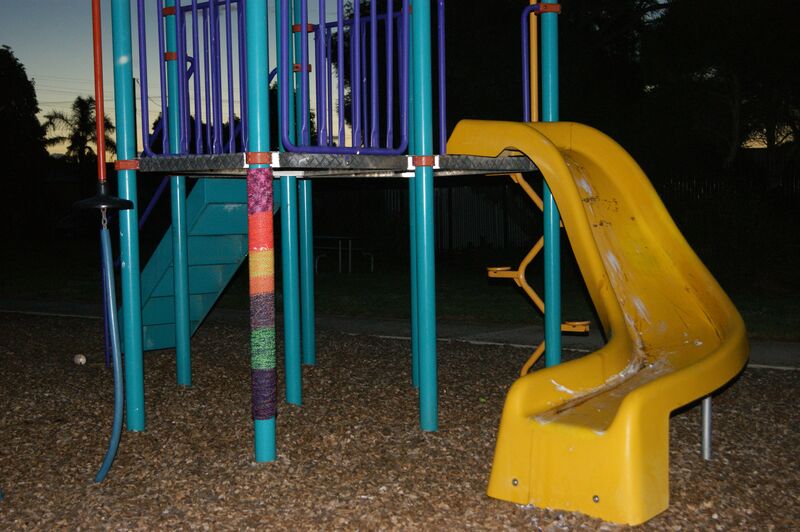 The repairs were done on the fly and the only tool we had at hand were some sparkly craft pipe cleaners. 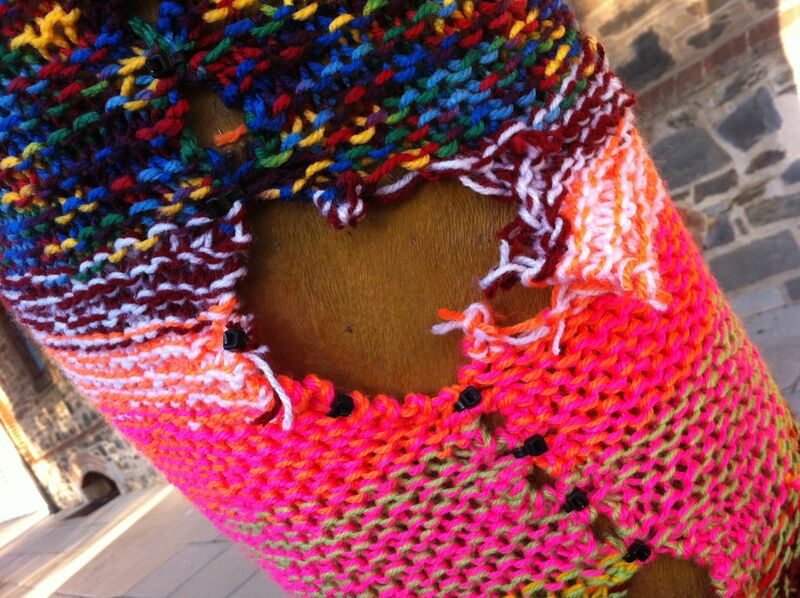 The pipe cleaners did their job well and I think even added some pizzaz to the yarn bombing. 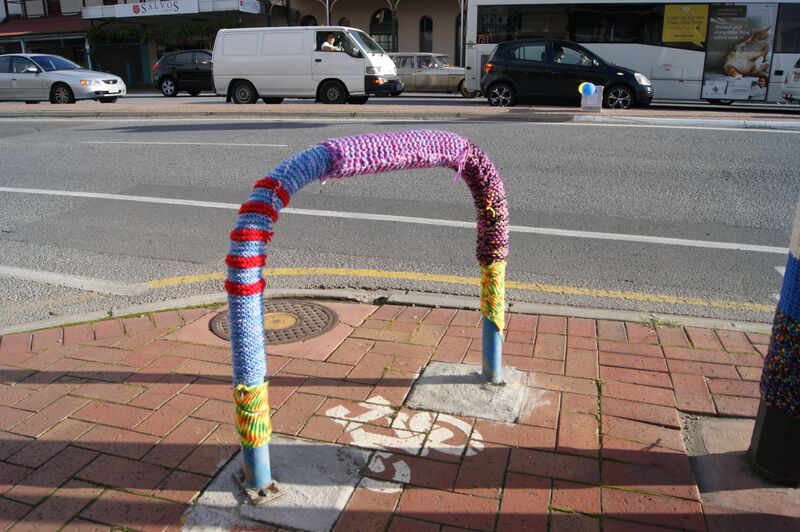 This entry was posted in Uncategorized, Yarn bombing and tagged craft, knitting, street art, yarn bombed, yarn bombing on July 22, 2012 by yarnbomb. 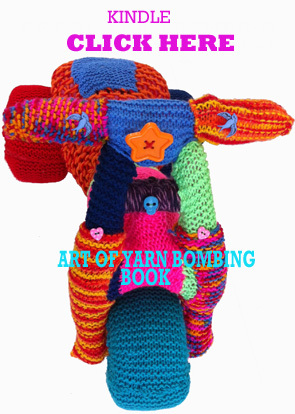 Knit bomb it. 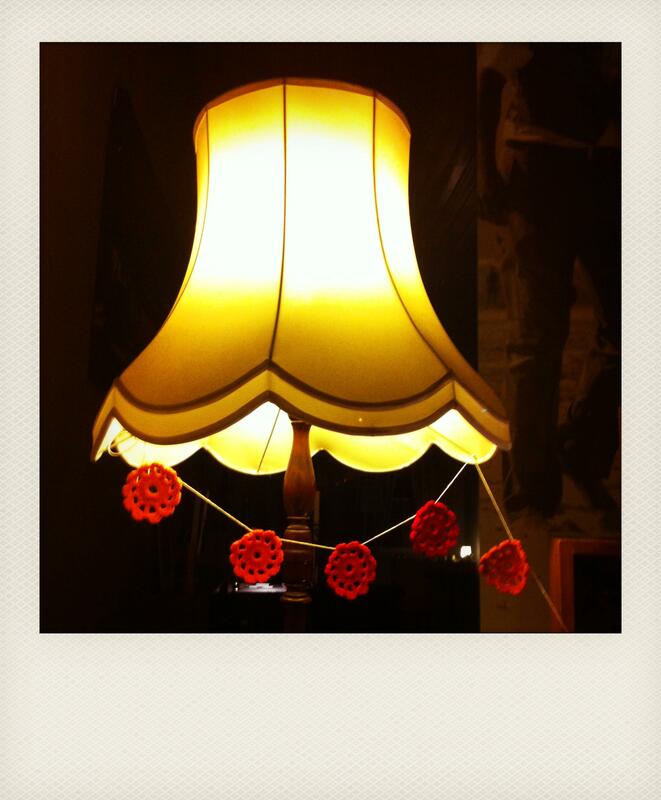 Craft it. 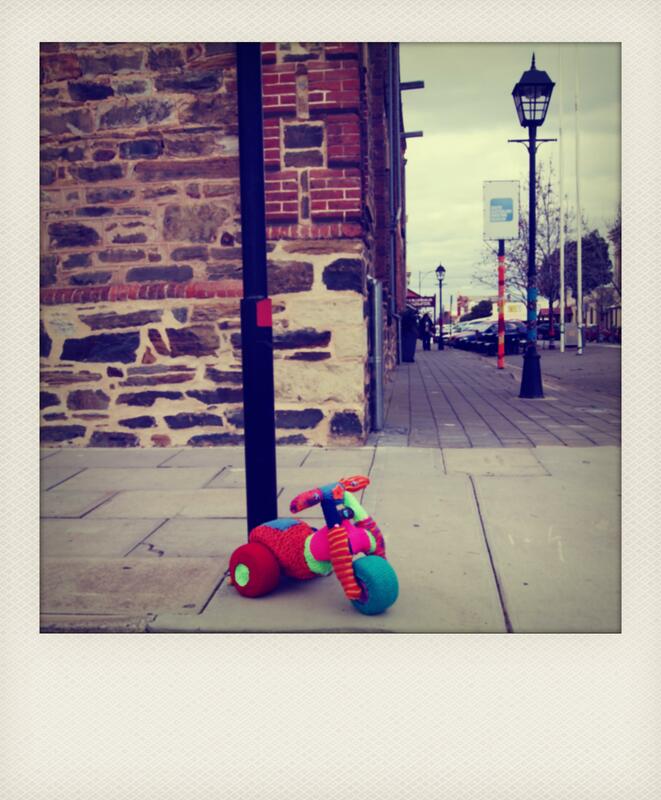 Photograph it. 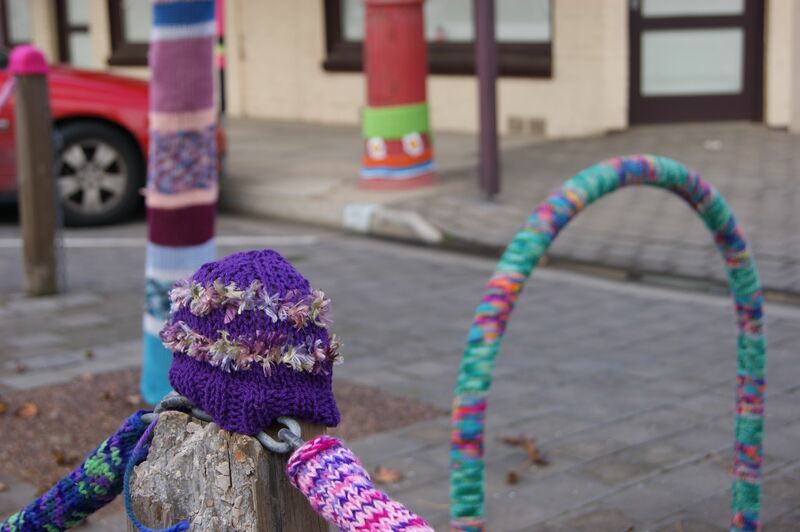 We have been putting up some yarn bombing around the neighbourhood to brighten things up a bit during winter. 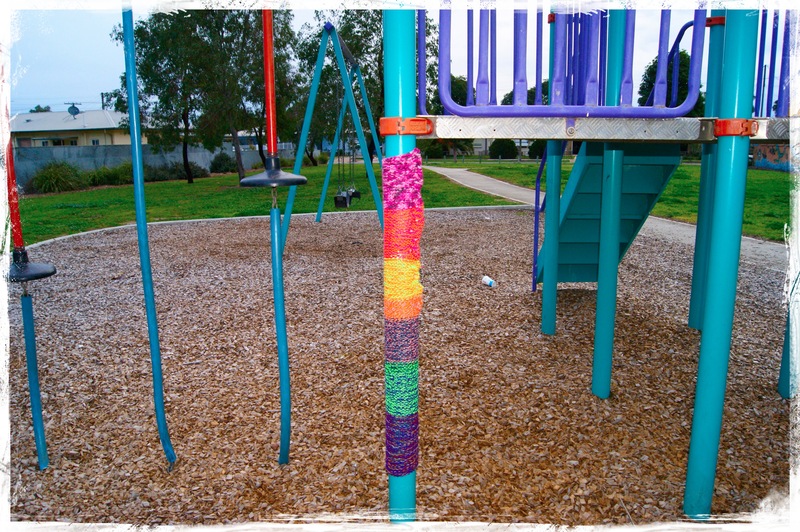 Most of our yarn bombing has been met with appreciation however the the knit bombs in the local playground were removed a few days after these photographs were taken. 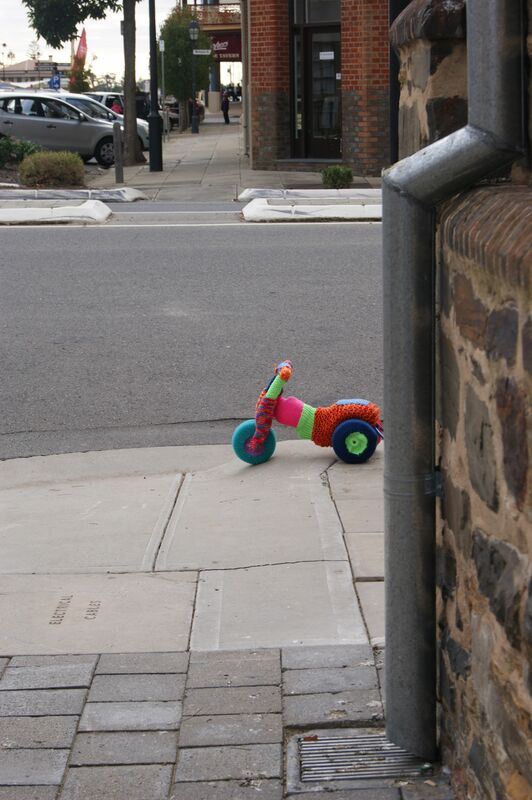 It’s always important to photograph your work in case the work is vandalised or removed. 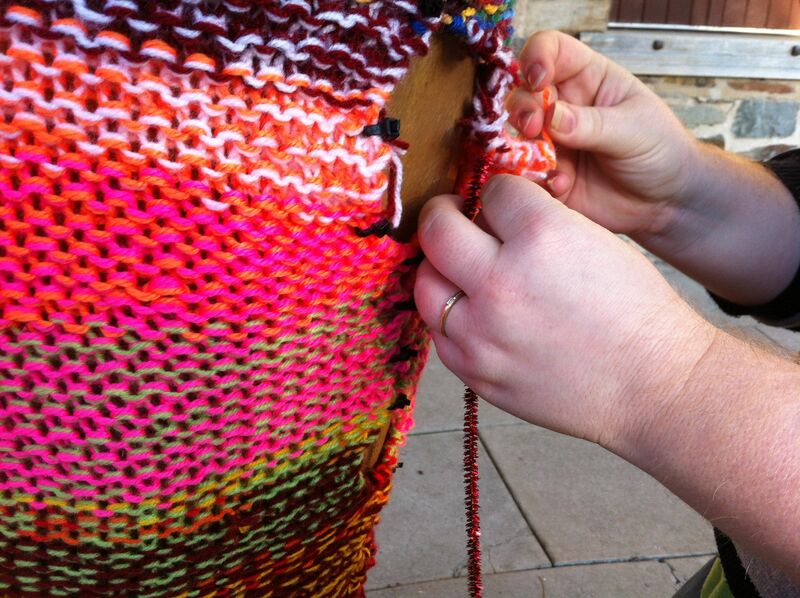 When you are doing public art like yarn bombing you cannot get to attached to the work because it can be tampered with or it could fade in the sun and rain. 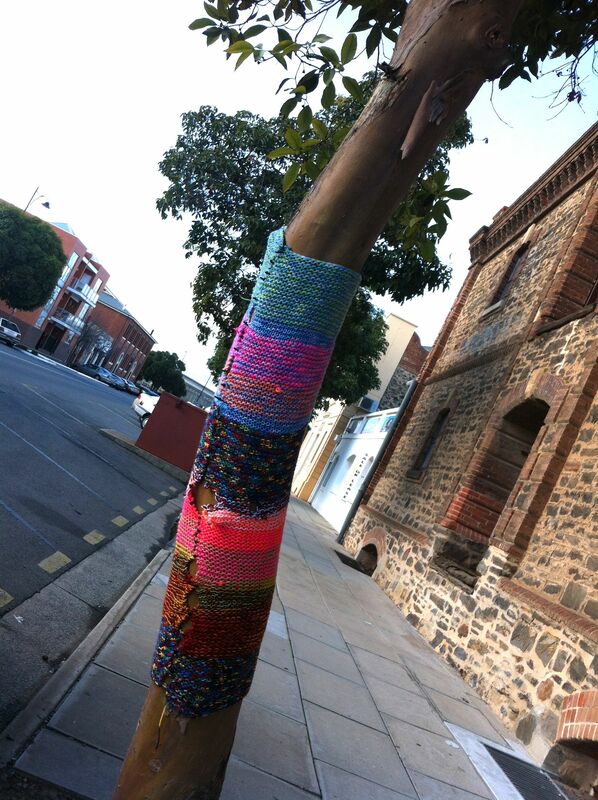 However some yarn bombing like the small piece in the tree pictured above lasts and lasts. 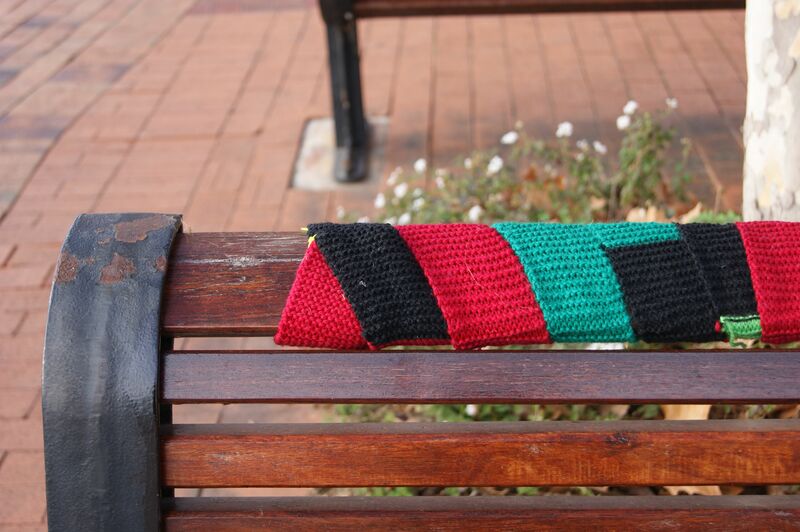 This piece was done approximately two years ago and the colour is still strong and it has not been removed but it has been stretched a bit. 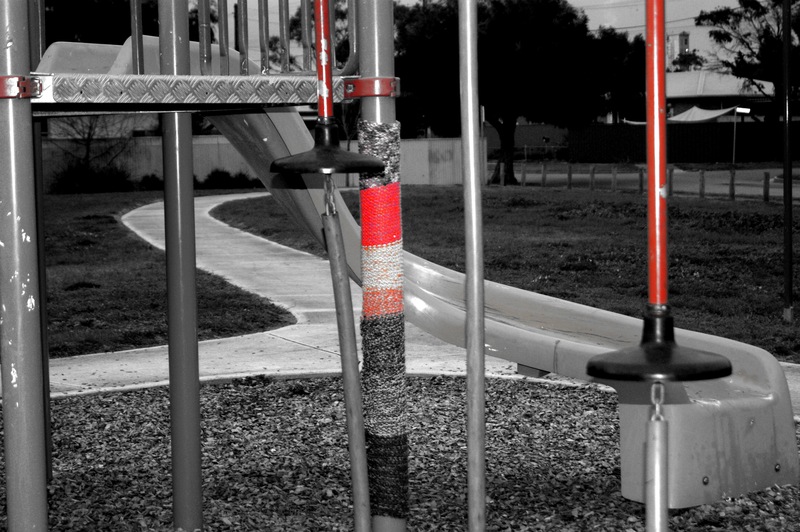 This entry was posted in Yarn bombing and tagged craft, knit, knit bombed, photography, public art, yarn, yarn bomb on July 17, 2012 by yarnbomb. 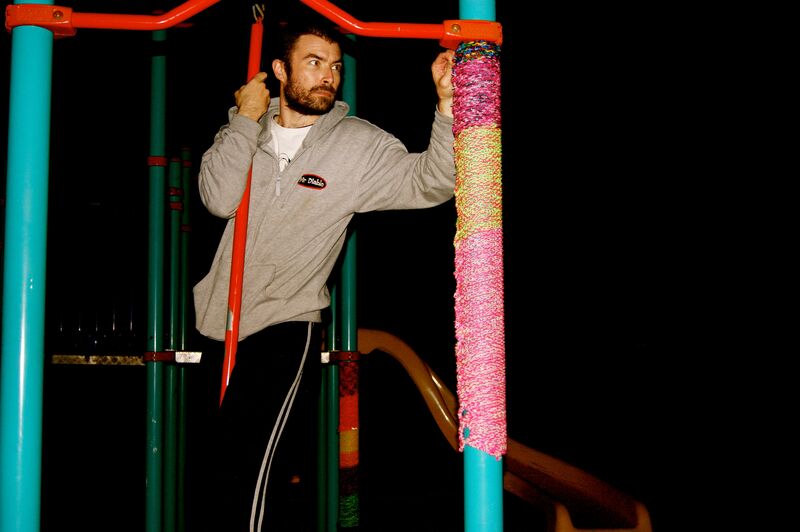 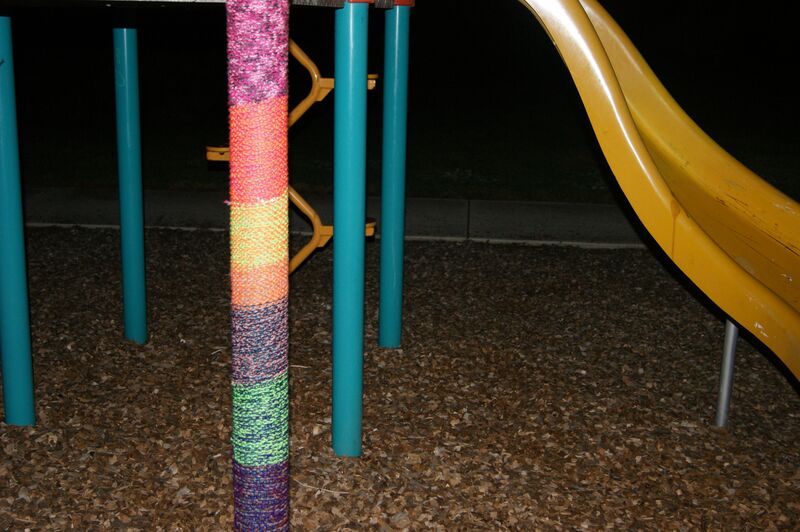 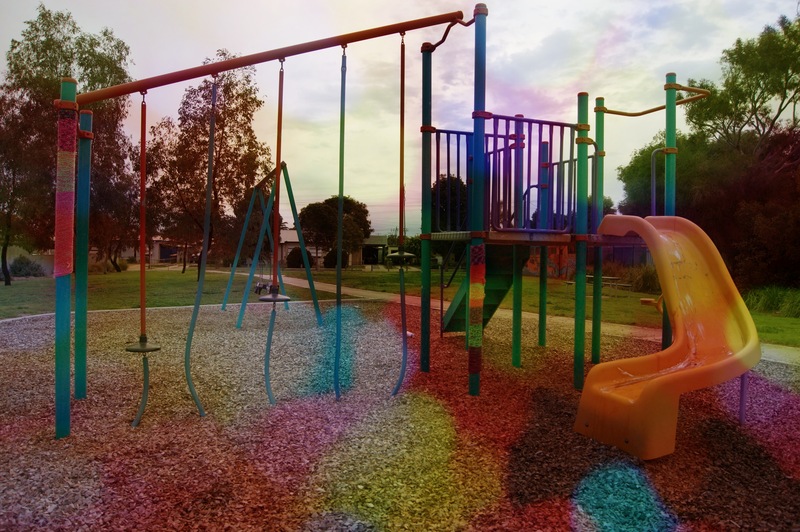 Yarn bombing the playground around the corner with rainbow knitting. 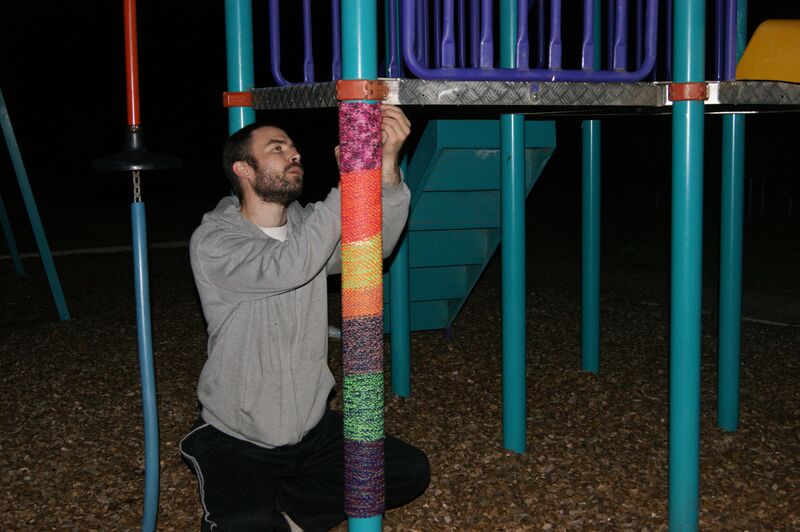 It is best to yarn bomb in groups especially if you choose to work at night. 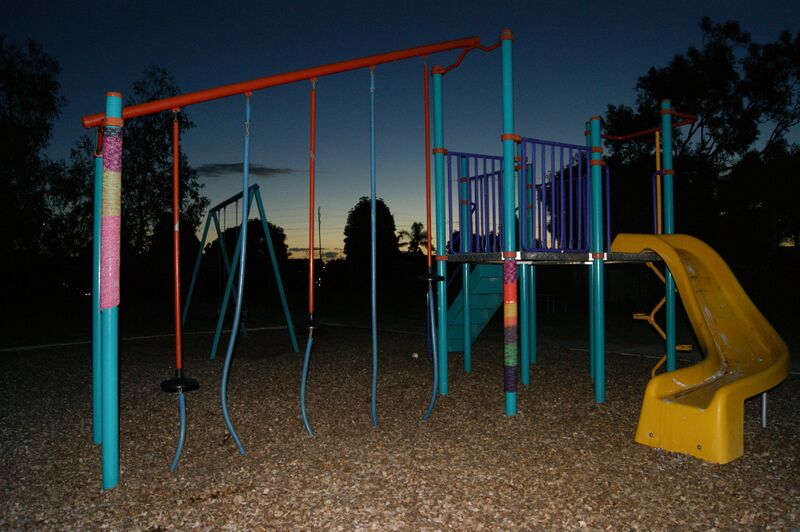 It was really dark in the playground last night and we had trouble seeing what we were attaching to the jungle gym. 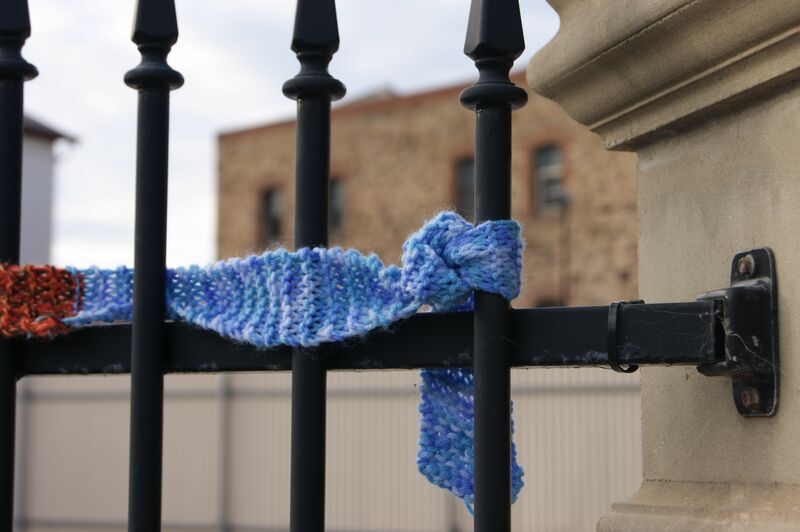 Knit photography in the crafty world of knit graffiti. 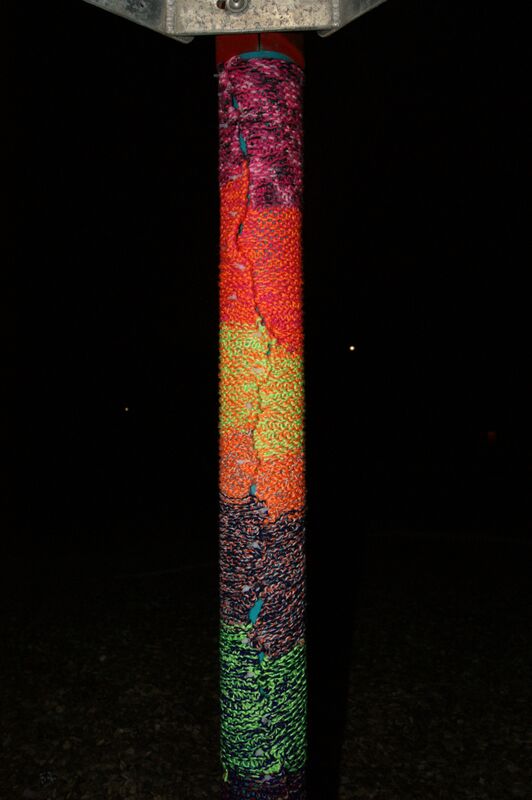 Yarn bombed tree’s seen by street lamps and car headlights. 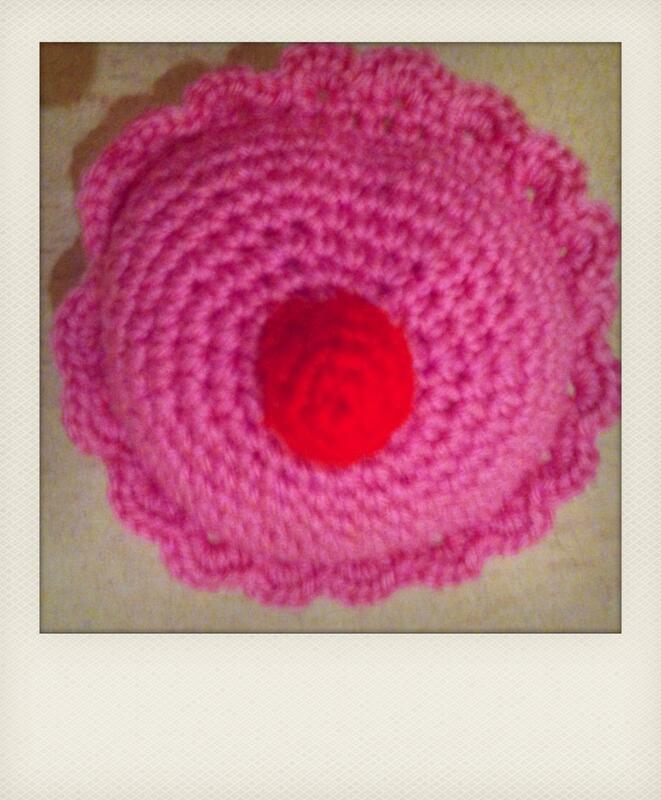 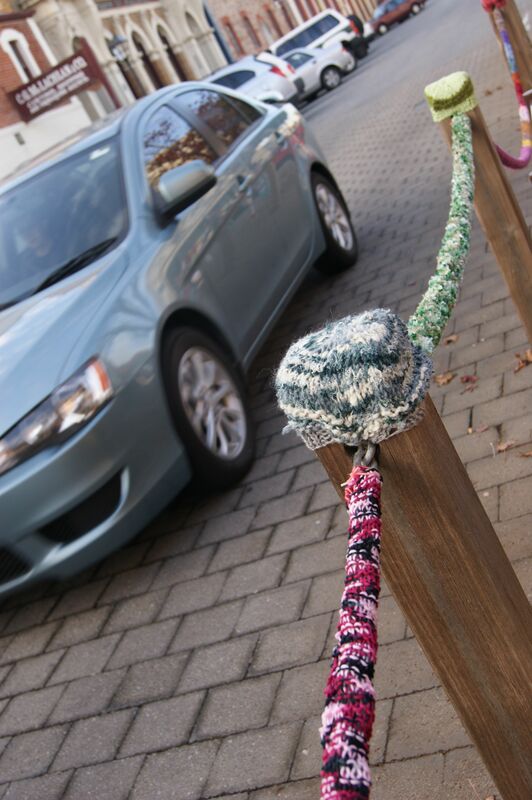 Part of the joy of yarn bombing is photographing the process. This entry was posted in knitting, Yarn bombing and tagged craft, knit graffiti, photography, yarn bomb, yarn bombing on July 9, 2012 by yarnbomb. 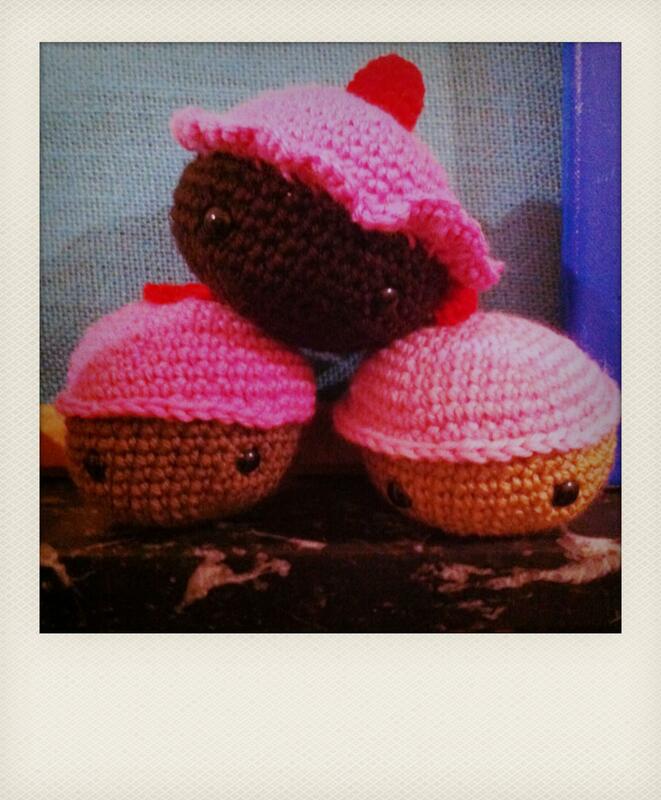 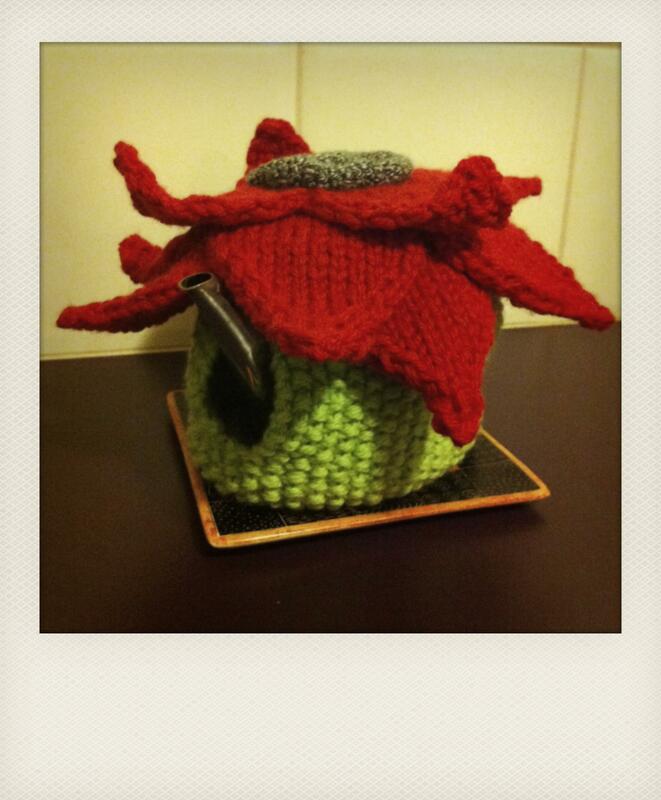 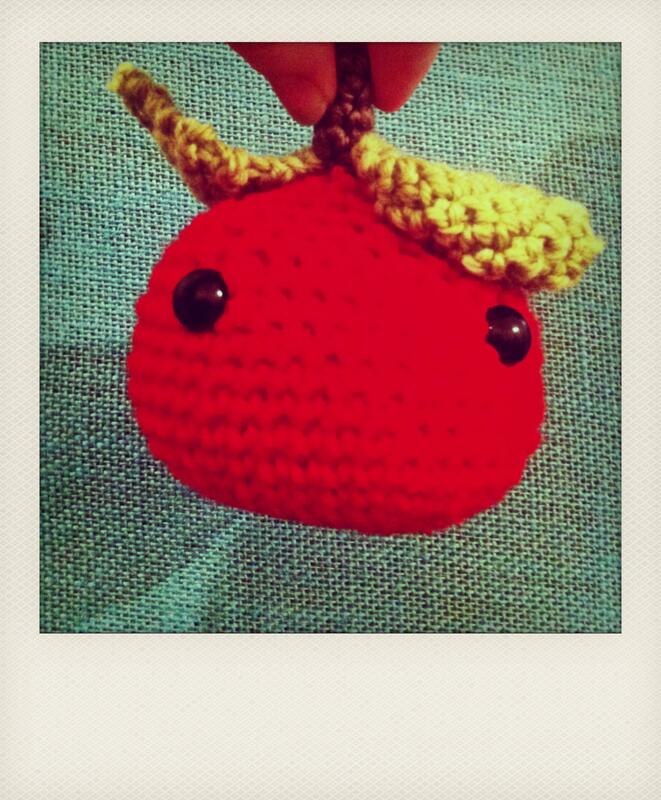 Craft is my favourite thing to photograph and craft is my favourite hobby. 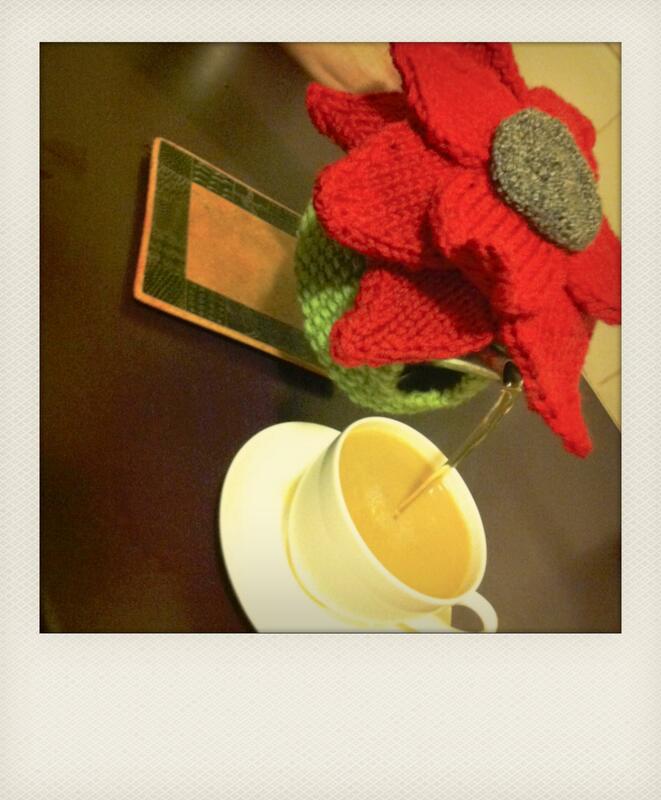 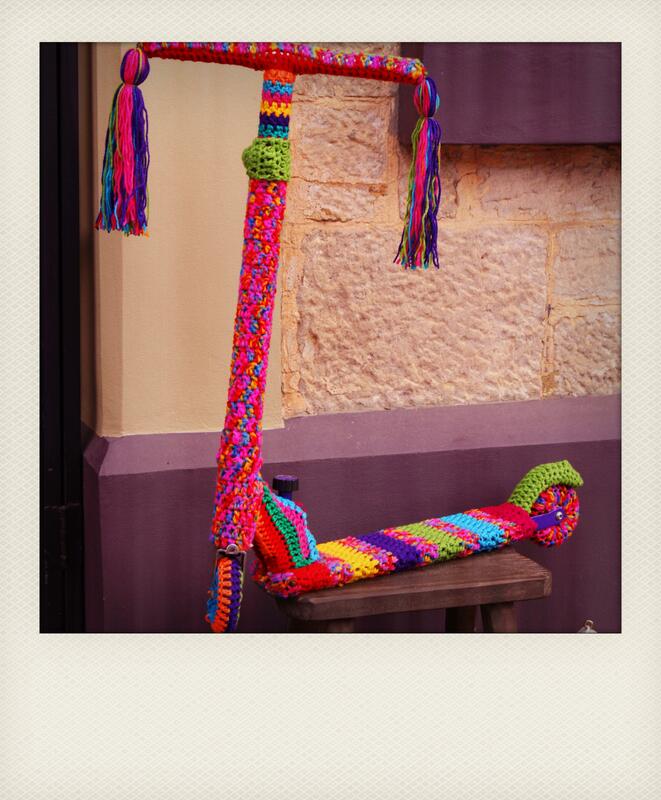 Please enjoy my photography and colourful craft. 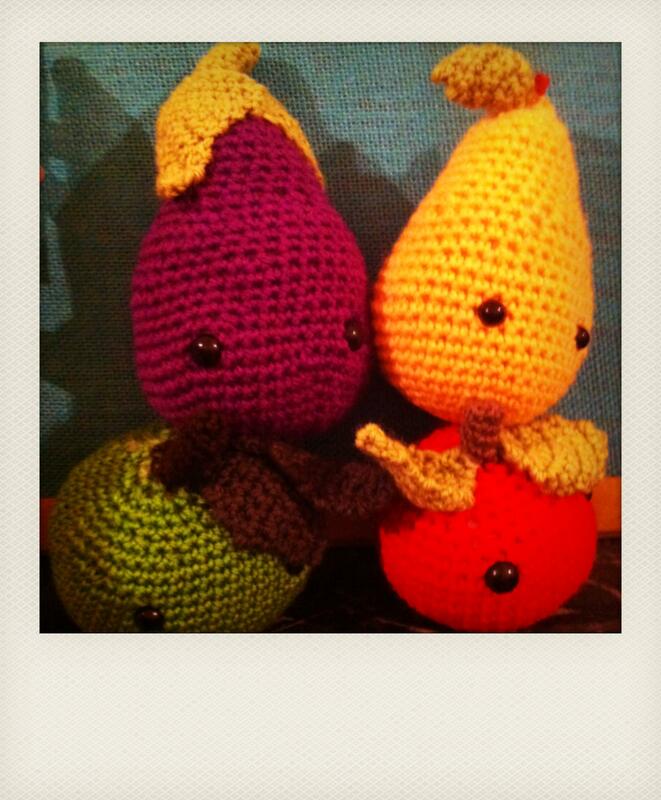 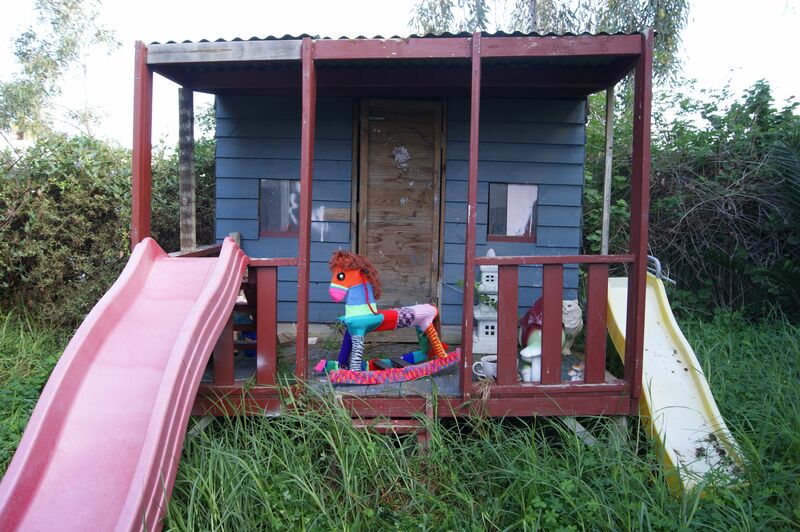 These yarn covered toys are showing up in all sorts of places. 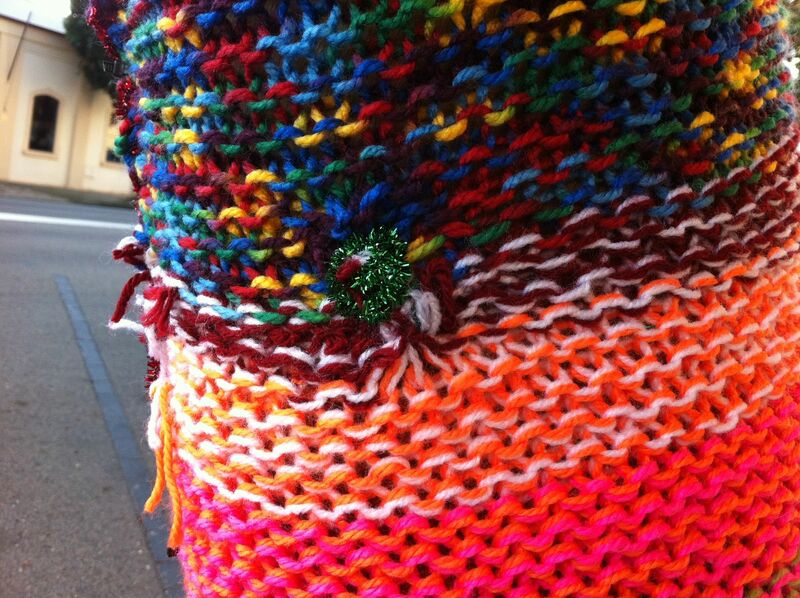 Yarn bombing is exploding in the streets in rainbow coloured knitting and crochet. 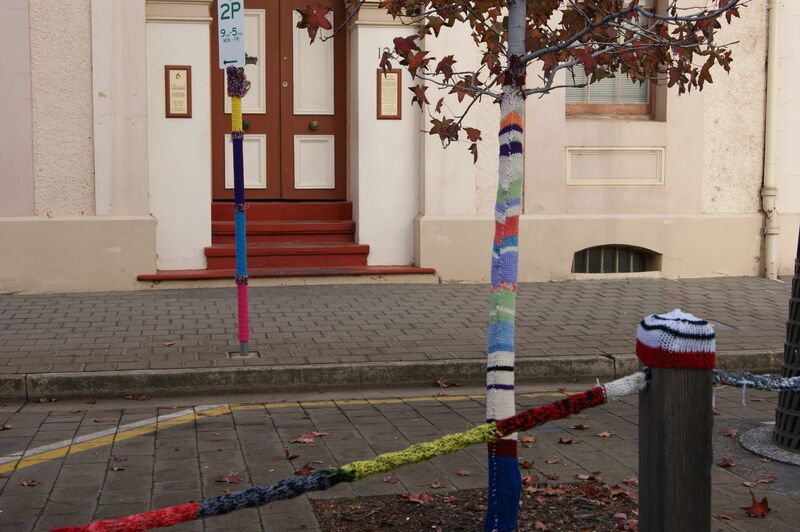 Post boxes, tree’s and poles are brightly festooned with yarn bombing in the streets of Adelaide. 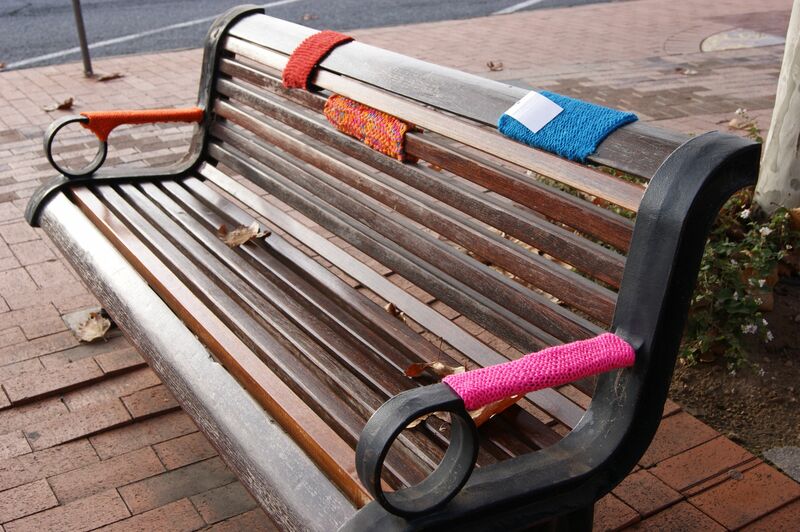 Even park benches are not immune to the craft fairies and their knitted squares. 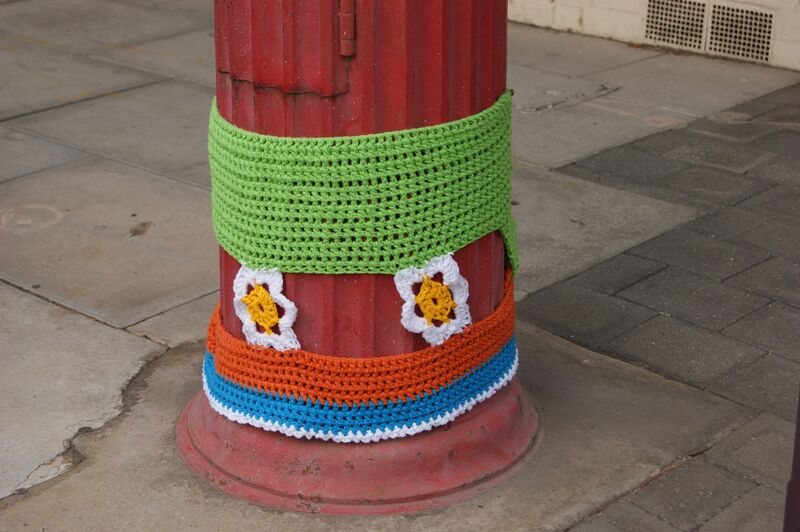 These yarn bombed posts are bright and visible to all drivers. 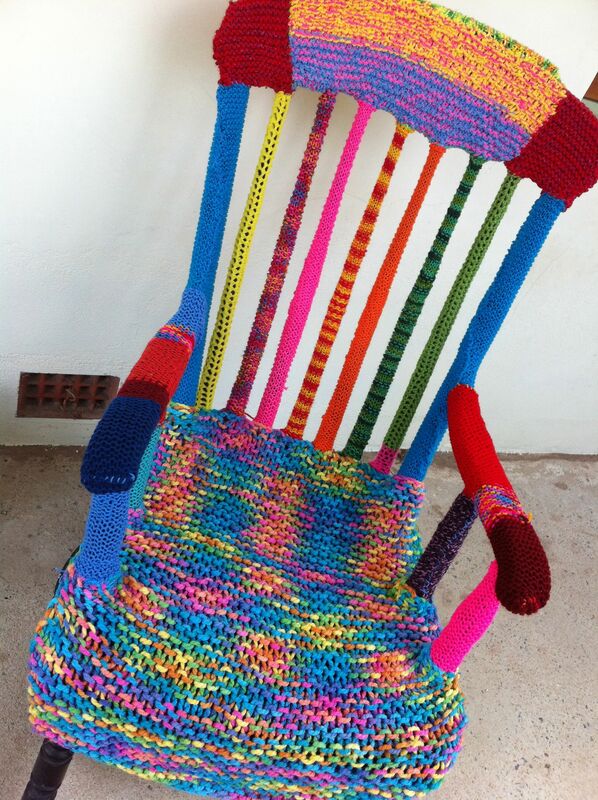 This yarn bombed rocking chair is colourful and soft. 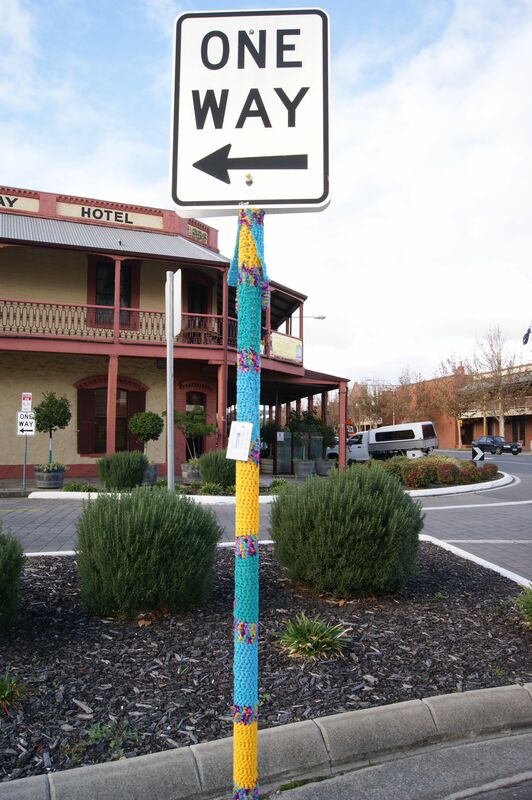 This entry was posted in Yarn bombing and tagged adelaide, craft, park benches, photography, yarn bombing on July 1, 2012 by yarnbomb.